A beauty salon or SPA center without special equipment is unthinkable nowadays. This offers their clients who are looking for a busy and tiring day in her salon relaxation. And of course, expect the same their employees to carry out their work professionally and successfully. The facial bed KP-6 BELLAVITA was developed specifically for beauty salons and medical centers. It is made of solid wood, high quality components, which is why we can guarantee a long service life. The deck is adjustable in height and has a removable headrest with built-in face hole. Therefore, the facial bed is also ideal for use as a massage bench. The sun is very robust and the design of the undercarriage ensures excellent stability. It consists of two segments, wherein the backrest can be mechanically adjusted in height. The armrests and the headrest are adjustable, ergonomically designed and comfortable. The design combines luxurious appearance with functionality and ergonomics. 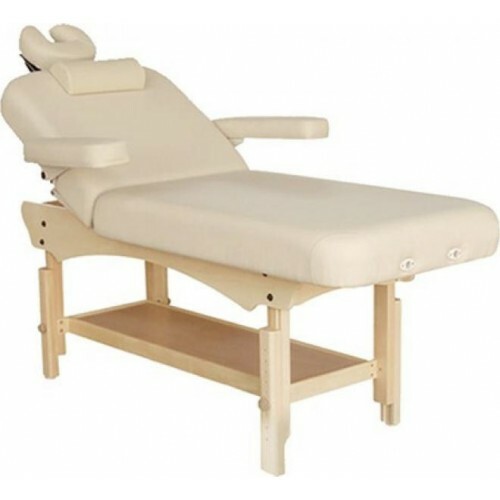 The padding of the facial bed is anatomically shaped and made of high quality and durable synthetic leather, which ensures functional and neat appearance even after many applications and chemical cleanings over a long period of time. The artificial leather is oil and water repellent and can be cleaned with commercially available disinfectants easily. The interior of the pad is made of soft polyurethane foam - a moisture resistant and hygienic material which is resistant to microorganisms. The exclusive use of natural materials for the upholstery ensures pleasant feel, comfort and wellbeing. A large, practical and highly accessible storage for storing towels and consumables has been integrated into the undercarriage of the sun. In sum, all these little details make the KP-6 BELLAVITA an ideal and reliable equipment. This model has proven its quality and durability in practice in countless applications and a wide variety of applications. The model KP-6 BELLAVITA offers an excellent price-performance ratio due to its flexibility and diverse application possibilities. The dimensions are as follows: 181 см x 76 см x 70 см. Treat your customers this couch and turn them into a solid each treatment.